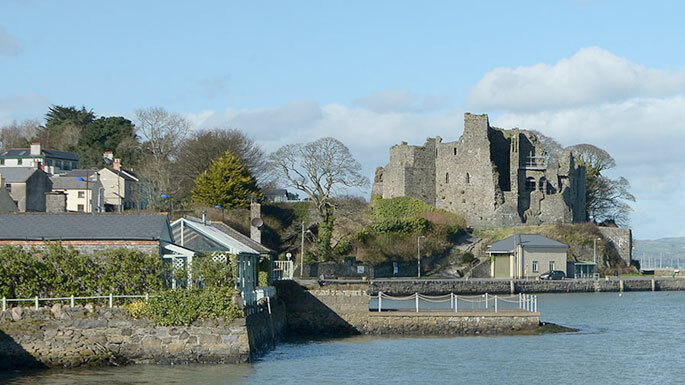 Carlingford is a beautiful small town at the heart of Ireland’s Ancient East. Its historic buildings and medieval streets are packed in the summer months and its compact nature – the centre is only about 4 streets – means you can easily see the main attractions in a few hrs. These include the impressive King John’s castle which guards over the town, Taafe’s Castle, The Mint National Monument, Tholsel Gates and more which make up the town’s centre. The bars and restaurants of Carlingford are internationally famous for their atmosphere and ‘craic’ and are all located within a small area giving the town a very cosmopolitan feel. Nowhere in Ireland can you see old Ireland and New Ireland combined in all its splendour within a few streets. The small nature of the town also means that you can rent houses and Holiday Homes right in the centre of the action in Carlingford. The location is an outdoor lover’s dream, with the Cooley Mountains and the volcano-like Slieve Foy Mountain in the background and Carlingford Lough with the Mourne Mountains Range in the foreground. Carlingford has become known as the Adventure Capital of Ireland, with the local adventure centre providing over 30 adventure activities which can be booked alongside our Holiday Homes or separately though their website www.carlingfordadventure.com . Carlingford Holiday Homes and apartments are all within a five minute walk of the centre of Carlingford. They are the perfect base for exploring Carlingford and Ireland’s Ancient East. We have a number of properties side-by-side so we can cater for large groups. Fitted out to premium 4* standard they are classy, comfy & cosy, your home away from home. As one of the longest standing accommodation providers in Carlingford with tonnes of positive online reviews our reputation speaks for itself. We take the worry and hassle out of booking your holiday home.